Join us for the next in our series of YA cooking programs. On Wednesday, February 20th we’ll be making personal pizzas, and on Wednesday, March 20th we’ll be cooking up fajitas. Registration required. Grades 5-12. See calendar for more details. Keep an eye out for some brand new programs for the Fall! Middle School Scene has moved to Mondays and Thursdays at 3:30. We’ll be continuing our YA cooking classes as well as offering a sewing class in October. There will also be college essay writing classes for high school students in October and November. Be sure to check out the teen event page for more details! 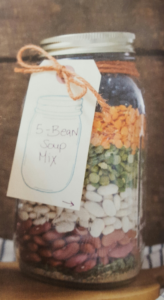 Bring a mason jar this Friday at 11am, and we’ll supply everything else you need to fill it with a delicious bean soup mix. Sample a cup of soup and get ideas for other mason jar gifts. Please register in advance. Every war produces its heroes, but the heroic African American men and women who helped carry America to victories have too often been forgotten. In this issue of History Now scholars and journalists join together to add black Americans to the narratives of the American Revolution, World War I, World War II, and the war in Iraq.